Yellow aztec print wrap style culotte jumpsuit with pockets. Model is 5’9” and wearing a size small. Navy verical striped jumper with tie waist. Model is 5’9” and wearing a size small. White and navy modern damask print jumpsuit with a deep v-neck. Model is 5’9” and wearing a size small. Multi-color thick striped flowy maxi skirt with scalloped edging. Coordinating top is sold separately. Model is wearing a size small. 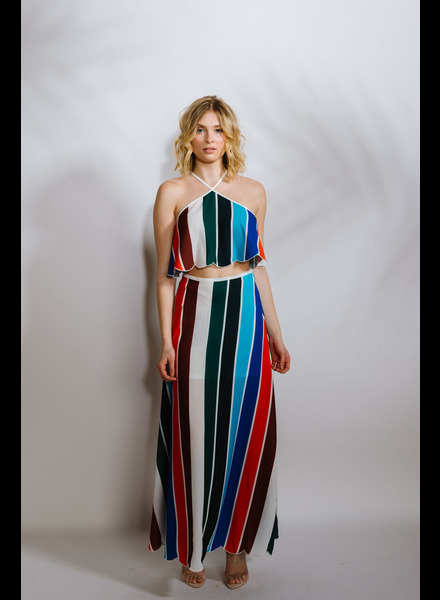 Multi-color thick striped flowy cropped top with scalloped edging. Coordinating maxi skirt is sold separately. Model is wearing a size small. Navy, red and white maxi dress with stripes and threaded tassel tiers and zig-zag petite straps. Dress is fully lined. Model is 5’7” and wearing a size small. Thick watercolor striped wide leg pants. Coordinating top is sold separately. Model is wearing a size small. Thick watercolor striped, self tie bandeau style bra top. Coordinating pants are sold separately. Model is wearing a size small. Blue and white striped linen blend bra style top with full silver exposed back zipper. Coordinating pants are sold separately. Model is wearing a size small. Blue and white striped linen blend cropped, fitted pants with front tie detail. Coordinating top is sold separately. Model is wearing a size small. Satin snake print midi-length skirt. Hidden side zipper. Model is 5’7” and wearing a size small. Lemon yellow ribbed, ruffle strap bodysuit with sweetheart neckline. Snap bottom closure with moderate back coverage. Model is wearing a size small. Bodysuits are final sale. Blue and white oriental print high rise, wide leg pants with red piping and elastic backing. Coordinating bra top is sold separately. Model is wearing a size small. Blue and white oriental print bra style top with red piping and silver full side zipper. Coordinating pants are sold separately. Model is wearing a size small. Red wrap style culotte jumpsuit with pockets. Model is 5’9” and wearing a size small. Black wrap style culotte jumpsuit with pockets. Model is 5’9” and wearing a size small. Red v-neck cropped blouse with o-ring wrap detail. Model is wearing a size small. Drapey white oversized blouse with open front and twist bottom detail. Model is wearing a size small.